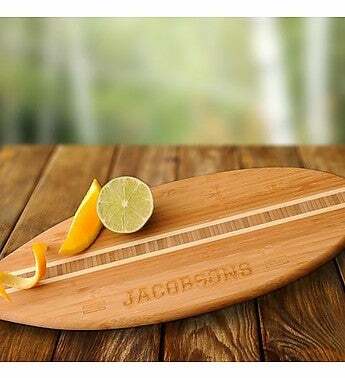 The surfer knows exactly how to ride waves in style, and this beach-themed gift is the best thing to complement his or her kitchen. A personalized surfboard cutting board is ideal for the chef who likes to hang 10 in the kitchen. A personalized cutting board makes for the most thoughtful gift for a bride and groom, surfer or generally laid-back chef. Durable, eco-friendly bamboo makes a great surface to chop limes for your summertime cocktail. Board measures 14 1/2" x 6" x 5/8"